Roman Catholic Mysticism of "Contemplative Prayer"
John Main (1926-1982) believed that the contemplative experience is open to all and creates community. His genius was to recover and re-present a way into the contemplative experience for ordinary people within the Christian tradition. In the teaching of the Desert Fathers on pure prayer he found the practice of the mantra. Realising that this way of prayer could further the search of many modern people for a deeper spiritual life, he recommended two regular daily periods of meditation to be integrated with the usual practices of Christian life. Find a quiet place. Sit down with your back upright. Sit still. Gently close your eyes and begin to recite your prayer-word, or mantra, silently, interiorly and lovingly throughout the time of your meditation: "Ma-ra-na-tha." Say it as four equally-stressed syllables. It is an Aramaic word (which is the language that Jesus spoke) and it means "Come, Lord." It is found in the Scriptures and is one of the earliest prayers in the Christian tradition. Do not think about the meaning of the word. Just give your attention to the sound of it thoughout the time of your meditation, from the beginning to the end. Whenever distractions arise, simply return to your mantra. Meditate for 30 minutes each morning and each evening, every day of your life. Father John always said: "Just say your word." Meditation is a way of pure prayer marked by silence, stillness, and simplicity. What does Roman Catholic Mysticism have to do with pagan Eastern Mysticism? Everything! In September 1994 His Holiness the Dalai Lama accepted the invitation of Dom Laurence Freeman OSB, Director of The World Community for Christian Meditation, to lead the annual John Main Seminar. "The Good Heart" became an historic event in which the familiar concepts of inter-religious dialogue were enriched with fresh meaning. During the Good Heart seminar the Dalai Lama read and commented on the Gospels from his Buddhist perspective, as a monk, and as the spiritual leader of Tibetan Buddhism. Christians and Buddhists declared how their experience of friendship through meditation and dialogue together had changed their outlook and views of each other in profound ways. Published in many countries the book of The Good Heart has reinforced the growing awareness that the future of world peace cannot be ensured without meaningful inter-religious dialogue rooted in the compassionate power of meditative silence. 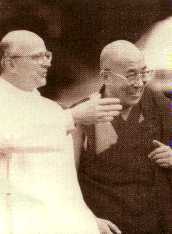 In February 1997 the Dalai Lama and Dom Laurence Freeman met again in Dharamsala to discuss how to build on what The Good Heart had achieved. Thus, the idea of The Way of Peace was born. 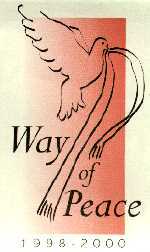 The Way of Peace is a three-year initiative which will employ different means to express the urgent relevance to the world of the Buddhist-Christian dialogue, and inter-religious dialogue as a whole. These means are: Pilgrimage, Retreat, and Peace-Making. In December 1998 the first of these means -- Pilgrimage -- will bring a broadly-based group of monks, lay-people and scholars to India. They will visit a number of sacred sites in a spirit of prayer and friendship. Between December 13th and 16th they will join with the Dalai Lama and other Buddhists for three days of prayer and reflection at BodhGaya, the most sacred of Buddhist sites, where the Buddha was enlightened. This time will be focused by meditation together. There will also be reflection together of the different meanings of enlightment, liberation and salvation. This same mysticism is being imported into many Protestant Churches (including SDA). Does this bring to your mind the "three-fold union" of Apostate protestantism, Roman Catholicism, and Spiritulaism prophecied to occur during the final events of the great contoversy?